It was evident from the get-go that the Nintendo Switch's Joy-Con controllers weren't just your ordinary gamepads. However, the console's launch event has revealed that they do much, much more than detach and offer local two-player play. The left-side Joy-Con has a sharing button, for starters -- you can take screenshots to show off memorable moments. The Switch won't share video right away (one area in which the PS4 and Xbox One have an edge), but Nintendo is promising that it's in the works. The Joy-Cons have both motion-detection and fairly sophisticated vibration feedback. In its promo clip, Nintendo claimed you could not only tell that someone had dumped ice cubes into a glass but how many cubes there were. And the left-hand controller can detect objects in front of it -- Nintendo used the classic "rock, paper, scissors" game as an example. Some of the minipads' features are expected. The right-side Joy-Con has an NFC pad for your Amiibo, and there will be wrist straps to avoid flinging controllers across the room. And did we mention that the Joy-Cons will come in blue and red? The best part: You won't necessarily have to pay extra for this gear. 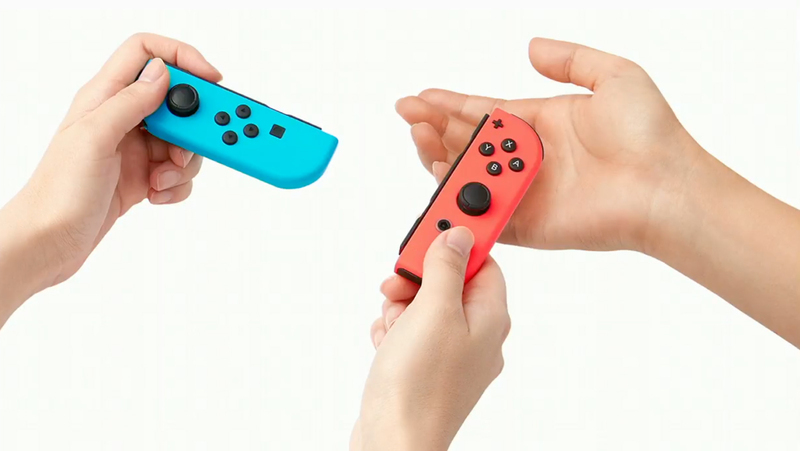 The wrist straps are included in the box, and you can buy a Switch system that includes the blue and red Joy-Cons for the same price as the somber gray models. If you do need extra controllers, they're $80 for a pair and $50 if you need just one for an extra player. An extra grip is $30, and the Pro Controller will set you back $70.